Chandra Mahal is located on the western side of the City Palace complex of Jaipur. Also known as Chandra Niwas, it is presently the residence of Maharaja of Jaipur. Constructed by Jai Singh II, the King of Jaipur, Chandra Mahal covers almost one-seventh part of the City Palace.Regarded as the most important and powerful commanding building of the City Palace complex, it has a seven storeyed citadel which provides a unmatched scenic view of the Jaipur city. Each and every floor in the Chandra Mahal has its own charm and importance. 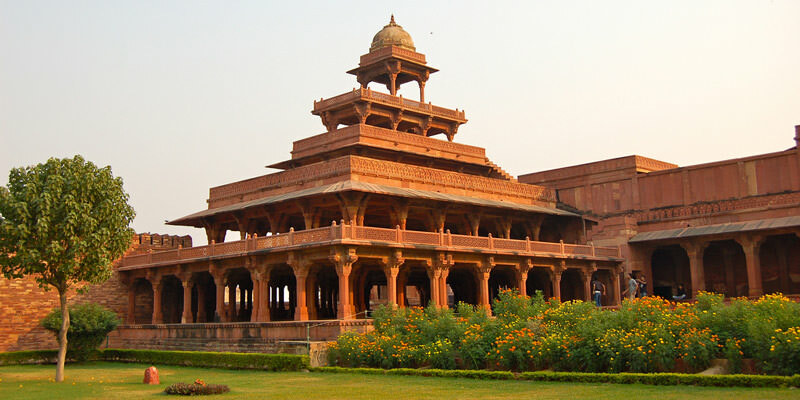 Chandra Mahal in City Palace is one of the most important buildings in the complex since it is the residence of the former kings of Jaipur. This is a seven floored building and each of the floors is named differently like Pitam Niwas, Sukh Niwas, Chabi Niwas, Ranga Mandir, Mukut Mahal, and Shri Niwas. All the floors have unique architecture and are decorated with beautiful carvings, paintings, and mirrors. One can see the flag of the Royal family at the top of the Chandra Mahal. This quarter size flag is unfurled when Maharaja is in the Palace and when away then Queen’s flag is hoisted. First Two floors of which are part of the Sukh Niwas Hall form the Maharaja Sawai Man Singh II Museum. Third floor is Sukh Niwas is the drawing and dining area of the Royal family. Fourth floor is Shobha Niwas which is also called as ‘Hall of Beauty’ and has unmatched decor with many unique paintings, mirror work on walls and floral decorations. Fifth floor is Chavi Niwas or the House of Mirrors which has architectural world of mirrors on its walls. Last and sixth floor is the Mukut Mahal or the Crown Palace where one can see the wonderful view of the hills surrounding Jaipur. The Ground Floor is the only one which is open to public and have a museum where tourists can explore the collections of the King like artifacts, manuscripts, carpets and much more. By Road: Chandra Mahal is located in the heart of Jaipur city, in the City Palace Complex. Nearest bus stand is Choti Chopad and one can easily reach here by local taxi or cab. By Rail: Chandra Mahal, Jaipur is well connected through Jaipur Railway station to major cities railway stations like Delhi, Agra, Mumbai ,Chennai, Bikaner, Jodhpur, Udaipur, Ahmedabad. By Air: Chandra Mahal can be reached through Jaipur Airport, also called Sanganer Airport which is well connected with regular domestic flights to Delhi, Kolkata, Mumbai, Ahmedabad, Jodhpur, and Udaipur.